Everybody who has been to Kimimi's Blog--and that's all of you, right?--knows that said blog's proprietress is an awesome chick. Well, I recently discovered that Kimimi is even more awesome than I originally imagined. 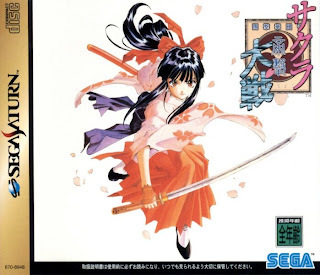 You see, after chatting with her--in the comments section of this blog post--about Sega's Sakura Taisen (aka Sakura Wars) series, Kimimi offered to send me her spare copy of the Saturn version of the series' first title. Sakura Taisen's beautiful box art. I know I could play the game using an emulator like SSF, but I'd prefer to play it on the real thing. So, I'm going to do my best to keep from playing it until I pick up another Saturn (and a copy of the awesome-tacular Saturn Bomberman). In the meantime, I'd also like to extend a hearty "thank you" to the folks at Aksys Games and Dudedle Studio, who recently sent me review copies of Hakuoki: Demon of the Fleeting Blossom and Sugar Shooter 2, respectively. Expect to see "somewhat gay" reviews of both titles shortly. Justin: Oh, the wonderful chatter you talk about is enough for me, honestly. This kind of thing is very nice, though--obviously! Anyway, does this make you want to start your own gaming blog? If so, I'd love that! Kimimi: Oh, I know you didn't do it for publicity. I just had to mention it here, though, because I thought it was so awesomely nice of you. I hope you don't mind? Anyway, thanks again! Oh no, I don't mind. There's no need for thanks though - just enjoy it! I don't know much about Sakura wars, but that's some pretty sweet boxart. Ha! Thanks for the pointers, Kimimi :) I definitely was planning on starting with 1, so no worries there. Which Sakura Taisen is your favorite, BTW? The first or the third? Huh. I didn't mean to stump you. I honestly thought it would be an easy one to answer! I guess it could be like asking someone to name their favorite Dragon Quest or Final Fantasy or Super Mario, eh? Pretty much! They're both excellent games that are well worth anyone's time and definitely the highlights of the series. Well, that's good to know (that both games are excellent and well worth my time). Thanks!